In today’s society, food additives are everywhere-even in the so called “nutritious foods.” Many of these additives are banned in both Canada and Europe, but unfortunately the FDA has not taken action against them in the USA. Fitness, is something you are easily able to control, while proper nutrition can be difficult because the average American has very little knowledge about what chemicals are in the food they eat. Additives are in bread, pasta, chicken, meat and even ice cream. Propyl Gallate: Used in vegetable oil, meat, potato chips, chewing gum. Used to preserve fats and oils and may cause cancer. BHA “butylated hydroxyanisole“: Used in cereals, chewing gum,vegetable oil, potato chips, and in food packaging. Found to cause cancer in rats. Potassium Bromate: Used in breads and rolls to increase the appearance of the crumbs and density of the bread. Bromate has been banned in all countries except the USA and Japan. Causes cancer in animals–California requires a “Warning” label be used on all products which contain Bromate and therefore, it is rarely used in the state. Monosodium glutamate “MSG”: Probably one of the most well know preservatives, it is a flavor enhancer. Used commonly in packaged foods such as soup, salad dressings, sausages, hot dogs, canned tuna, and potato chips. MSG has been linked to sudden heart attacks. Aspartame aka Equal or NutraSweet: Very common in diet soda and other low calorie or diet drinks. Causes brain tumors in rats as well as leukemia. People sensitive to aspartame experience headaches and shaking. Sodium Nitrate: a coloring and flavor preservative found in bacon, ham, hot dogs, lunch meats, corned beef and other deli meats. Can lead to cancer causing chemicals called nitrosamines. Avoiding these food additives is as simple as reading the nutrition label on the back of the products. The more information you have the better choices you can make. Look for foods that aren’t processed, are fresh, locally grown and in season, it’s more cost effective. Remember the better your nutrition is the stronger your fitness results will be! Use the right kinds of foods to fuel your body. Follow us on Facebook for more Heart Smart Minute Nutrition tips! 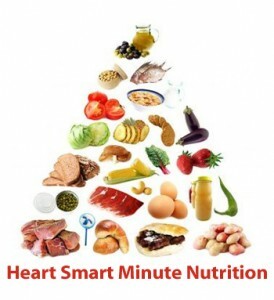 This entry was posted in Nutrition and tagged additives, food, harmful, Heart Smart Minute Nutrition, Nutrition. Bookmark the permalink.